In August of last year, I stopped to see a potential client in Ohio about a gate restoration. 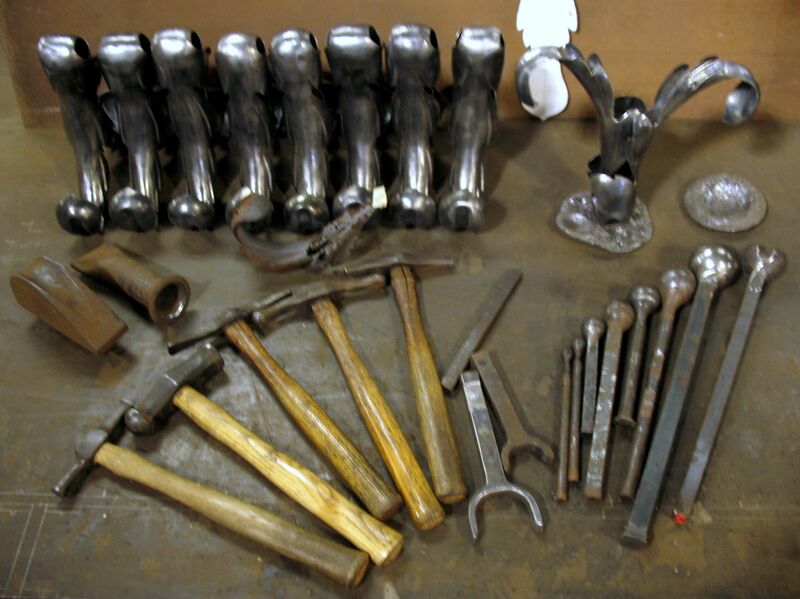 The client, a fabricating firm, was needing someone to reproduce 12 different forms, i.e. 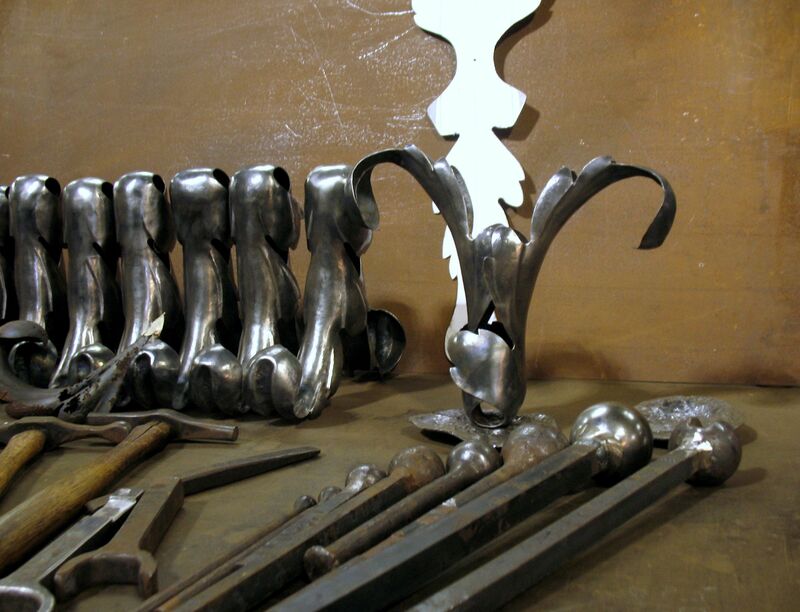 calyx/husk forms, acanthus leaves, rosettes, and more, using the process of French Repoussé. There are two identical driveway gates being restored. 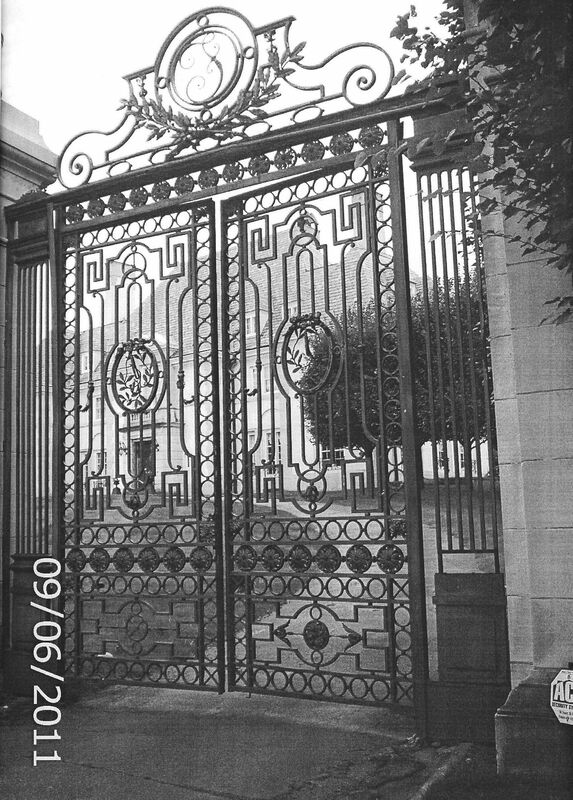 These gates were made by the French master blacksmith, Edgar Brandt (1880-1960.) 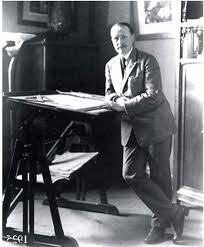 Brandt (below) is known for producing fine architectural ironwork, as well as for the same in the Art Deco style. The gates are massive, measuring roughly 15’W x 14’H. 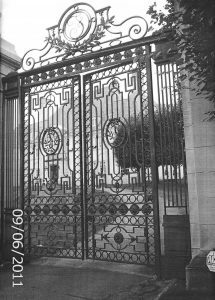 The gates are signed by Brandt, which is unusual, as blacksmiths of his era did not typically do so. To reproduce these elements, I have only images and a few remnants of the originals, which have in many cases rusted away to almost nothing. Using these remnants and images, I begin by making a pattern, and then through trial and error, refine the pattern until I have a fine representation of the original. As many of the originals were stamped, I am producing an artisans version of such. 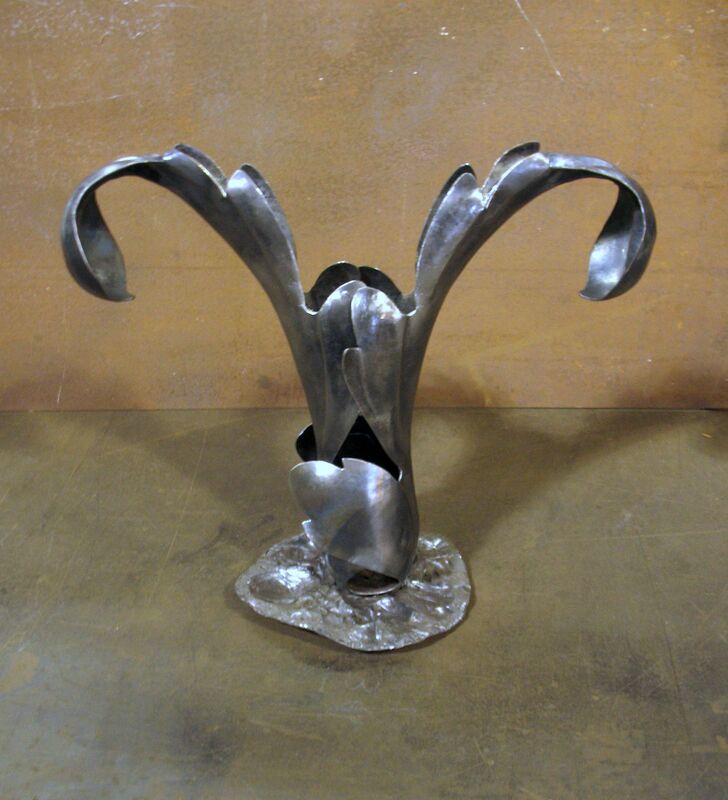 The original pieces were made of 18 gauge steel, which is what I am using for the reproductions. The calyx forms shown here are the first of 510 pcs to be reproduced. 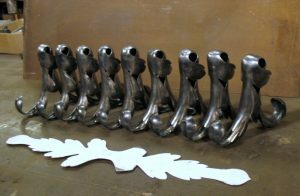 There are 16 of these forms to be made, 9 of which I have completed thus far. The anticlastic bend, is a very stubborn bend to produce, as metal does not want to bend in this manner. 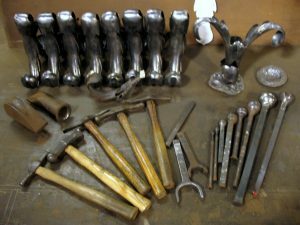 The tools used to produce it include a set of top and bottom tools, i.e. a saddle with a depression, and a top tool to contain the piece while bending. French repoussé is typically accomplished “cold”, meaning that heat is not applied to aid in shaping. That said, I have found it easier to apply heat to the piece when forming the anticlastic bend. 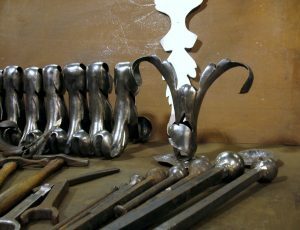 As the pattern for this form is so long, at 29-1/2″, I also found it difficult to work alone while making this bend, as the weight of the pattern itself worked against the process. I needed a helper to support the piece, as to insure the weight would not reverse the desired results. Since utilizing a helper requires not only another person, but also requires that person from his other duties, I pondered what might be modified to perform the bend without the aid of a helper. The “Fly Press” was the answer. 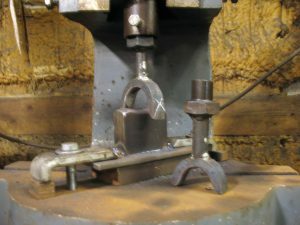 I simply applied the same tooling to the fly press, along with heat, and I was able to execute the bend alone. See the set-up below. There are two top tools, and one saddle. 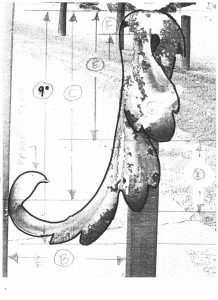 The top tools have different radii to accommodate the changing arcs in the form. Using the fly press (and heat) cut the time to produce the bend in half. Heat was applied using a “gas saver” set-up with an oxy-acetylene torch, with a rosebud tip, mounted in a vise. This way, I can apply heat readily to specific spots on the pattern. As with many new forms, I needed to make several new bottom stakes to produce this form, as well as new depressions in a wood stump for roughing out the form. Lead blocks are also used for bottom support for localized details. Start to finish, including cutting the pattern out from the 18 gauge sheet stock (using a band saw), then finish filing the pattern, there is about 8-9 hours into each piece.